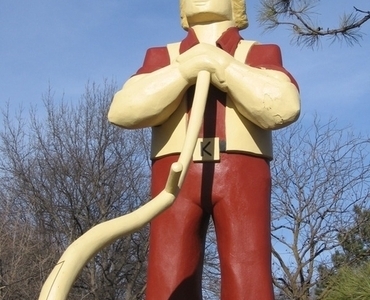 Johnny Kaw is a mythical Kansas settler and the subject of a number of Paul Bunyan-esque tall tales about the settling of the territory. The legend of Johnny Kaw was created in 1955 by George Filinger, a professor of horticulture at Kansas State University, to celebrate the centennial of Manhattan, Kansas. The stories were initially printed in the city newspaper, The Manhattan Mercury, during the centennial and later collected into a self-published book by Filinger, who created Kaw to be Kansas' answer to other heroes like Bunyan and Pecos Bill. Elmer Tomasch of the Kansas State University Art Department provided ink drawings to illustrate the stories and the book. Fiilinger's stories related how Johnny Kaw created the Kansas landscape, geography and pioneer trails. Kaw was said to have dug the Kansas River Valley, planted wheat, invented sunflowers, and grown giant potatoes. Kaw even controlled the weather, lopping the funnels off tornadoes and wringing out the clouds to end droughts. His pets were the mascots for the two state universities: a wildcat and a jayhawk, who enjoyed a good fight. The Dust Bowl was said to be a result of their fights. Filinger's book was not republished after 1969, but Kansas author Jerri Garretson released a children's picture book about Johnny Kaw in 1997. Her book was illustrated by another KSU art instructor, Diane A. Dollar. A color edition of the book was published in September 2011 and the original B&W version was included in the 2008 anthology, "Kansas Tall Tales." A 30-foot-tall (9.1 m) statue of Johnny Kaw holding a scythe stands in the city park in Manhattan, Kansas (39.1802°N 96.5736°W). It was constructed in 1966 at a cost of $7,000. All materials and labor were donated, and contributions were made by local citizens who hoped that the statue would establish Johnny Kaw as a local legend and would prove to be a roadside attraction. The statue is constructed of concrete over a steel beam framework. The design was intended to withstand wind and weather and be easy to maintain. The statue was featured in a Zippy the Pinhead comic strip on September 17, 2005. Here's the our members favorite photos of "Roadside Attractions in Manhattan". Upload your photo of Johnny Kaw!